Ernest Deane was born on 4th May 1887 in Limerick, the third son of Thomas Stanley Deane and Aileen Annie (née Byrne), of Bank House, Rathkeale, co. Limerick. His father was manager of the National Bank, Rathkeale, co. Limerick. Ernest was educated at Corrig School, Kingstown, and at the Adelaide Hospital, Dublin, and took the licences of the two Irish Colleges in 1909. After playing for the Irish Hospitals against the England Hospitals at Richmond on 3rd February 1909 he was selected to play for Ireland. It was to be his only cap on the wing against England at Lansdowne Road when he replaced in the Ireland side Basil Maclear. The 1909 match against England attracted a crowd that paid a record £1,000 for admission to Lansdowne Road. 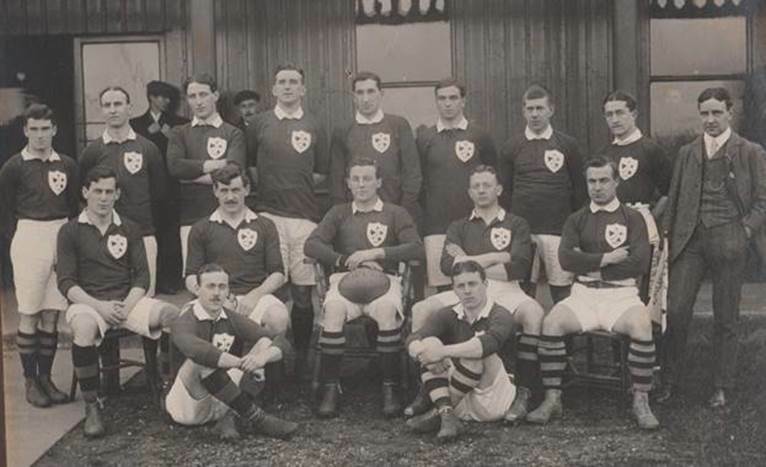 Irish expectations were high as England hadn’t won there since 1895 and had an unsettled side, trying out 31 players in four matches. However a performance inspired by Edgar Mobbs and Alexander Palmer, a New Zealand born doctor, won the match for England 11-5. Ireland side that played England in 1909. Deane is standing, far left. He entered the R.A.M.C. as Lieutenant on July 28th, 1911, and was promoted to Captain, with all the other lieutenants in the corps, on March 30th, 1915. In his case this special promotion came only four months earlier than he would have been entitled to it in the ordinary course of events. Before the war he was serving in India, at Lucknow; he came to Europe with the Garhwal Brigade, and was attached to the second battalion of the Leicester Regiment when killed. …a standing patrol 120 yards in front of our line was bombed by the enemy at about 10p.m., the only notification being two loud bomb explosions. Captain Deane, without any knowledge of the enemy’s strength, at once got over the parapet and ran by himself to the spot, under rifle and machine gun fire. Finding four wounded men, he returned for stretchers and got them back into safety. At 5.30am the Battn was in positions of readiness in accordance with orders in four lines opposite their objective with bombing parties, sandbag parties and carrying parties all arranged and in position. At 6.00am the first line got over the parapet quickly followed by the second, the left had to right form to get in line with the right as the trench ran back from a salient near the centre. As the first two lines went out the third and fourth filed into the vacant positions in the firing line. The gas affected a number of our men, and the smoke caused a dense fog and direction was difficult. Casualties began at once and the third line was ordered out to fill up gaps. Owing to the thick smoke it seemed likely that gaps would occur on the flanks and at 6.07am the fourth line was sent out with special instructions to maintain touch with the units on either flank. At about 6.10am the left were over the German parapet and our flag was seen flying on their lines. The left went forward with such dash that they outstripped the 2nd/8th GURKHAS and came in for a lot of fire from rifles and maxim guns from our right. This caused a good many casualties including all the officers and most of the NCO’s of A Coy which was the extreme left. Undeterred the men went on, got over the uncut wire and reached the road with parties of the 2nd/8th GURKHAS and gained their objective. In the meantime our right had not fared so well. They went forward in good line under a heavy fire till held up by the German wire. A number of our men here were collected in the ditch in front of the German wire waiting for developments. Ernest was killed instantly by a bullet to the head when helping some wounded in the open at Neuve Chapelle. He was the most gallant fellow I have ever met, and we loved him in the Regiment, both officers and men. He was just a part of us, and the few of us left mourn his loss very deeply. We had a big battle on the 25th and your son went out to try and help some wounded in and got killed. I believe his death was instantaneous, but I am not sure, as I was wounded myself, and had to be taken back. His body was recovered and buried by our Padre, and I will give you exact location of the cemetery afterwards. Everyone knew Deane as one of the bravest of the brave, and it was only the other day that he got one of the best deserved and gallantly won honours when he was awarded the Military Cross. I cannot tell you how sorry I am about your son, and how much I sympathize with you and yours in your loss. I have known him since he came to Meerut some 18 months ago, and remember how keen and pleased the dear lad was when he received orders to proceed to the front. Since then he has had various duties, latterly with the 2nd Leicesters, and in all situations he has quitted himself like a true man. I know the regiment miss him dreadfully….Your son was straight, fearless, indefatigable, always cheery, and never anything else but conscientious and gallant. I was present at his funeral at the cemetery in the Rue-du-Bacqueret on Sunday, the 26th inst.- the day after he died gloriously. 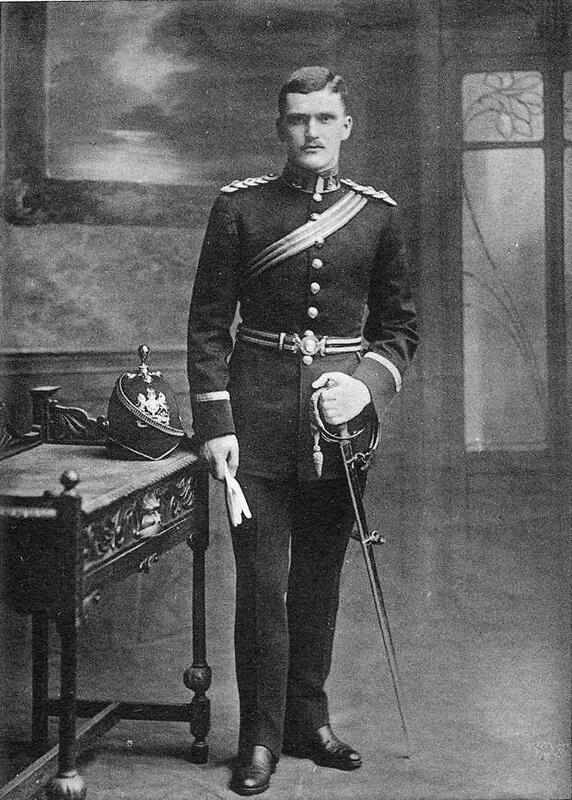 In his will on 18th December 1915 he left to his father £1,112 15s 10d equivalent to over £1 million in today’s money. About the Author – Patrick Casey is the historian at Clifton Rugby Club in Bristol. The oldest surviving rugby club in Bristol. His www.cliftonrfchistory.co.uk is the largest rugby club history website in the world. He is currently working on a History of the Memorial Ground, the former home of Bristol Rugby Club, and the rugby players of Bristol, over 400, it is dedicated to. He works for a firm of Architects in Bristol. Please like the World Rugby Museum on facebook and follow us on twitter to receive further tributes to the international rugby players who fell in the Great War. This entry was posted in International Players, Ireland, Lest We Forget. Bookmark the permalink.